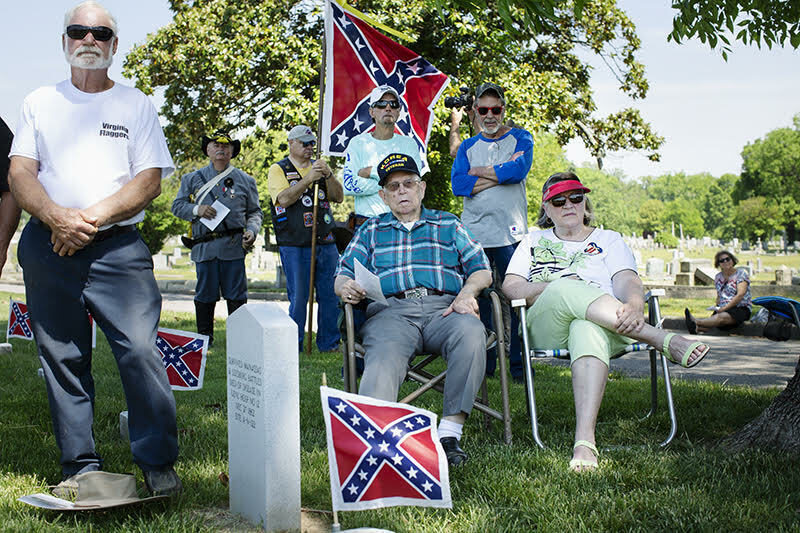 “Confederate Memorial Day” celebration at Oakwood Cemetery Confederate Section, in Richmond, Virginia, organized by the Virginia Flaggers. In 1902, Virginia’s all-white legislature established an annual allocation for the care of Confederate graves. Over time, spending has totaled $9 million in today’s dollars. Dozens of kids mill around a sprawling field of grass, on a warm, fall day in Biloxi, Mississippi. They stare up at a man in his sixties, who is dressed in 19th-century clothing. There’s a table heaped with relics from the Civil War — satchels, binoculars, saddles, guns. And other adults, dressed in Civil War costumes, show the kids how to load a musket. One yells “Fire in the hole!” and a massive boom rings out. There’s more musket fire to come. The main event this weekend will be a mock Civil War battle, part of the annual Fall Muster. This alternative version of history is coming from a man dressed like Jefferson Davis — who was president of the Confederacy. This place is Davis’ former home, a vast estate called Beauvoir, one of the grandest Confederate historical sites in the South. Today, it has become a monument to everything he stood for. In debates over Confederate sites like Beauvoir and memorials like the statue of Confederate commander Robert E. Lee in Charlottesville, site of the deadly Unite the Right rally in 2017, you’ll hear people defend them by saying they’re part of our heritage, part of our history. But how is that history being told? And more importantly, who’s paying to keep it alive? We investigate these questions in this episode of Reveal. For more on this project, explore “The Costs of the Confederacy,” our partnership with Smithsonian Magazine. Research assistance from Jasper Craven, Erin Hollaway Palmer, Richard Salame of The Investigative Fund, now known as Type Investigations. Brian Palmer is a visual journalist based in Richmond, Virginia.